A majority of Nigerian nationals at home and in Diaspora have argued for the reinstitution of true federalism via restructuring of a unitarian federal state imposed by an army of mendicants who ruled for their tribes in the seventies through the eighties, nineties and the millennium. These rising voices are filled with genuine patriotism and love of motherland unparalleled in the history of political struggles for freedom in Africa. It is important that these Africans be acknowledged, and supported, as the real Third Force of the socio political equation. They understand the true history of the Nigerian political struggle which attended the amalgamation of the North and South by colonial parties who had brought divide and rule politics to that African region. With paper and tabloid independence, the conquered regions were simply, by disingenuous British design, passed off to an oligarchy in the north that was backward, callous, dirty and ostentatious with politics of number and manipulation. Ahmadu Bello, the parochial leader of a backward north had personified the dirt and festering poverty of consciousness which Nigeria was quickly to descend under the deplorable control of a heritage of Islamists with a primitive culture of child educational neglect, corporate barbarism and environmental squalor in its organic wake. To have given commanding position in national affairs to the feudalist and patriarch, which he promptly passed on to another kinsman in the person of Tafawa Balewa, marked the beginning of the depredation and, hence, the devolution of the Nigerian project. It became institutionalized in the political graphology of the manipulated conclave that only a stooge, never capable of independent, original or thoughtful universality for economic dynamics, must be goaded to preside over the Nigerian state. The Nzeogwu revolution had pretended to arrest the drift of the nation from the hands of culpable tribal chiefs called founding fathers of a fledgling and directionless neo colonial state. Throughout the northern, western and eastern regions, the visionary promise of the true Nigerian icon known as Herbert Macaulay fazed with the springing of a copious array of tribalists emerging as sages and prophets of post independent Nigeria. Probably the Zik of Africa excelled in the vision of Macaulay to bring about a truly egalitarian Nigerian and African liberated consciousness. But that was not to be, as tribalism found vent in political betrayals endemic among non visionary primordial instincts that shaped the administration of the sixties. The era of military pillage which saw the enrichment of Gowon, Murtala, Obasanjo, Babangida, Abacha and Abdulkarim marked the further descent of a nation into a dark age of history. A spell of intellectual retardation, vicious survivalism and official predation was methodically syndicated into the 1999 constitution to promote the fortunes of these armoured mendicants of their tribes. This only served to bequeath the big for nothing West African a coven where religion, being the Christian and Islamic hegemon of mass brain washing, determined who controlled whatever apparatus that would contrive the seizure of state resources for control and redistribution by a certain group of the faithful within a mythical El Dorado of the oil dependent Nigerian economy. We must tabulate the imbecility of Nigerian leaderships in the contest of the historical struggles that have devolved to killing and maiming and state sanctioned abductions under the current conundrum of the Muhammadu Buhari bandit clan. Unbeknownst to the best instincts of voters who clamoured for change in 2015, they had become co conspirators to another regime of federal sanctioned thieves of “All Progressives” from “Peoples Democracy” in every federal, state, local government and legislative organ as decreed into due process by the rogue 1999 constitution. Nevertheless we must continue to expose the mendacity, frivolity, paucity of evolution, vile deceits, and all actions and inactions that led Nigerians to their present marginal existence under an intellectual quisling from Nigeria’s core north in the person of Buhari. Muslims, Christians, indigenous religious devotees must unite in order to extirpate this scourge foisted from corporate British economic adventurism on the soils of native peoples of sub saharan Africa. For it isn’t just a curious anomaly that the recent constitution proved a marked departure from the Richard’s, Macpherson’s, and Littleton’s that preceded independence from Britain. Nigeria’s touted 1999 document still remains a deliberated conspiracy against the will of the people. It was drafted and imposed by thieves and brigands of the forces inspired by such shallow fervor that could only spring from miseducated warlocks under their politics of dominion, redaction and the art of shameless dissembling. Its fall out is the cronyism and nepotism now typified in Muhammadu Buhari and his horde of parasites and sycophants. And all they purport for a nation building project is to ensure that the greater majority of indigenous people live in fear and pious hallucinations, while a vampire sect of Muslim and Christian defenders of faiths, along with their families, feed off the labours and vast resources of the people. Their operative methodology is the issuance of cycles of intellectual mendicants and tribal simpletons at federal and state legislatures in order to allow for the perpetuation of mass hysteria infesting their religions and spread by their fundamentalist adherents. The roll call of so called presidents, state governors, and assembly members, as fostered by the 1979 and 1999 constitutions, attests to the medieval mindset of these serial fabricators. Under this noxious document have mendicants of the tribe, namely Shagari of Sokoto, Obasanjo of Ogun, Yaradua of Katsina, Jonathan of Bayelsa and, now, Buhari of Daura, filed their ghoulish statures through the poisonous corridors of Aso Rock, unleashing cluelessness, depredation, corruption, and ultimate desecration of the destiny of Nigerian men, women and children. It remains significant that each of these charlatans that ruled for the bandit clans was at best an unfortunate accident, a distortion of democracy rolled with a blind following on a trail of pestilence. This has seen the discombobulation in positive motion for the freedom of humanity in this part of the planet. Through the long, dark history of Nigeria as an enforced nation state, opposed to a consensual federation, the common pathology of lleadership is the draconian resistance to any form of restructuring that promises to unleash the diverse creative potentials of their people for positive educational and scientific transformation. Thefore let us not tire to tell that the Nigerian unitarian constitution will never impact any positive legacy that will arouse the creative, or healing, instincts of the people for peaceful coexistence and collective group actualisation, no matter how the bigots may resist the calls by well meaning nationals to reform the polity along the lines of true federalism and peaceful coexistence among ethnicities long overdue to enact their inalienable divine powers of creative expression, control their economic resources, and enforce the social contract of securing life and property. Since the question of how we upgrade the human resource development of Nigeria to world best practices, and the peaceful coexistence of ethnicities in a clime of equal rights and justice, under a structurally balanced federation, may be anathema to outdated minds like Gowon, Obasanjo and Buhari, to get it right in 2019 demands the ultimate sacrifice, the laying of all resources of mind and body in service to every act of subversion against the charlatans whose only mission, whose peer group, is the continuation of the status quo in a long interminable play of sectional and personal advantages. So, give or take, Nigeria must be restructured. 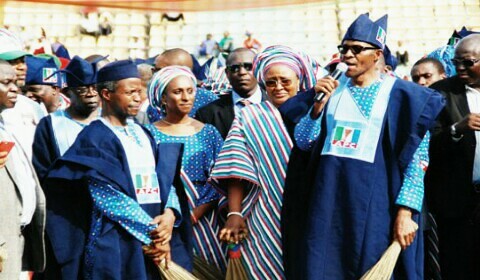 Because sectional advantage being the language the faulty system of Nigeria and its promoters can speak, rewriting the constitution in the spirit of true federalism shall remain the panacea to overturn the narrative, culminating in another resounding defeat of the darkness when the APC government of Muhammadu Buhari, the last of the mendicants of their tribes, is decisively ended in 2019.